Distance is not an obstacle when it comes to finding some top nosh, and to that end, I am more than happy to venture beyond the reaches of my Oyster card. The historic town of Dorking, twenty five miles away from London, recently proved to be one of these newly found foodie destinations. A 50-minute train journey from London's Waterloo (quicker than it takes me to get to some parts of West London from my home in Islington), Dorking is a small and prosperous Surrey town, but most importantly it is also home to "Little Dudley House". 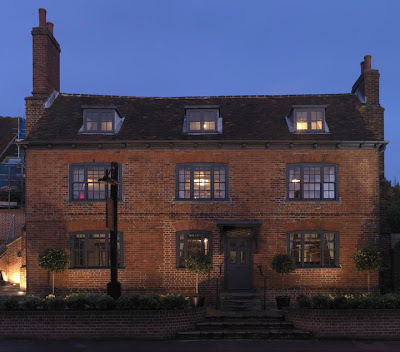 Built in 1733, the building has been sympathetically refurbished, its interior showing an elegant contrast of modern and traditional styles, with exposed beams and brickwork in the bar and dining areas, and a stunning glass conservatory towards the back of the building which opens up to an outside space. I was invited to Little Dudley House alongside Eduardo Sant'Anna owner of Start Space by Tony Austin, the restaurant's general manager, for their Autumn 2010 Food and Wine Showcase. This included eight dishes from the new seasonal menu accompanied by a selection of wines from the re-launched wine list, specially chosen by The Vineyard in Dorking. The event was open to the public and was priced at £55 for eight courses including wine, which I believe to be outstanding value. The restaurant's a la carte menu is predominantly British, with seasonal ingredients and reassuringly short. Most main dishes are reasonably well priced at between £12 and £18 and include "Beer battered fish, chips, minted peas and tartare sauce" @ £12, "Whole grilled lemon sole, herb butter, samphire and new potatoes" @ £18, or a "Whole baked lobster, hand cut chips and garlic butter" @ £28. The selection of steaks, all served with thriced cooked chips, is also noteworthy particularly for the 42 day aged 12 oz Cote de Boeuf Steak priced @ £20. On the evening I visited, we were presented with 3 different "flights" or 8 tasting courses in total. "Flight One" included some of the new starters on the menu such as "Curried cauliflower soup with apricot puree" @ £6 (paired with Estrella Damm Inedit beer from Spain) and "Rope-grown Scottish mussels with leeks, bacon and a cider cream sauce" @ £8 (matched with a South African Chenin Blanc from Jordan) which were both excellent. The best starter in my opinion was the "Venison Carpaccio with horseradish creme fraiche and bramble jelly" @ £9, served with a fruity Chilean Pinot Noir from Nostros. I enjoyed the delicate game flavour of the paper thin slices of venison against the spiced crème fraiche and felt that @ £9, this was also excellent value. "Flight Two" presented three new main courses including "Lemon sole fillet and lobster Mousseline with parsley sauce" (paired with an outstanding Spanish Albarino from Martin Codax Rias Baixas), "Duck breast with roasted foie gras, fresh blackberry and Cassis sauce" and " Rump steak with a black pepper corn sauce". Despite being a real steak fanatic (and Little Dudley House's was tip top) I felt that the duck had the most interesting flavours in this flight. "Fight Three" was a delicious medley of warm desserts including "Rice pudding with mulled wine and poached damsons (served with a delightful South African muscatel from Graham Beck Rhona) and "Chocolate fondant served with Horlicks ice-cream. The chocolate and ice cream combination worked very well together and were the perfect match to the black muscat "Quady Elysium" (a sweet red wine) from the USA. The event drew in a mix of influential people from the food and wine industry including Karen Barnes, editor of Delicious Magazine, Lucy Taylor, Head of Restaurant Relations for Toptable, Ralph Hochar of Chateau Musar (maker of some of my favourite wines) and Adrian White, owner of Denbies, the largest vineyard in the UK on the outskirts of Dorking. 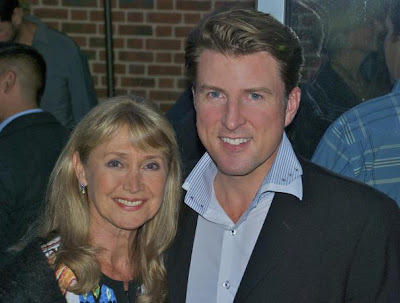 Despite my total lack of celebrity awareness, I was thrilled to see some familiar faces from TV like celebrity chef Valentina Harris, the BBC News reader Jan Leeming and Aggie MacKenzie of How Clean is your House? Valentina was very friendly and approachable, but I spent most of the evening talking to Jan Leeming, a fascinating woman with many stories to tell and who also turned out to be a great dancer. After dinner, Lucy, Jan, Eduardo and I danced the night away at Little Dudley House before making our way back to London. I thoroughly enjoyed my visit, the food and wine pairings were excellent and I look forward to returning sometime soon. Cost: The London Foodie was a guest of Little Dudley House. I estimate that a three course meal at this restaurant will cost around £30 excluding drinks. Likes: The "Light Meals" section of the menu includes choices such as their home-made burger with thriced cooked chips @ £9, as well as other options priced between £6 and £18 and are excellent value. The wine list is impressive, particularly for their eclectic choice of sparkling wines, including Millesime 2006 from Miolo, my favourite Brazilian winemaker from Vale dos Vinhedos. Verdict: Little Dudley House is a British restaurant serving good quality, reasonably priced food and drinks in very elegant surroundings. My place of choice whenever in Surrey. Highly recommended. What amazing value - and looks stunning! Spectacular! Not at all what I would have expected from a rest in Surrey. Nice to see the love being spread around to these great places outside London. @ Greedy Diva - totally agree, and well worth a visit! @ thewanderingfoody - loved the ice cream, and cannot wait to make it at home sometime soon. @ Tuck - I know the feeling, but we shouldn't think that London has got it all, like LDH, many outstanding restaurants are outside London.